Georgina is breaking bread at a “Family TABLE” on an epic scale after a sit down between a Pefferlaw pastor and the president of Taiwan over family values earlier this month. 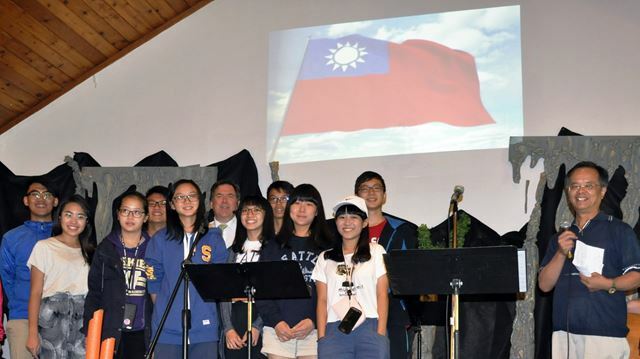 And this past Sunday in Pefferlaw, the entire congregation of Cedardale Church of the Nazarene joyously welcomed the 10 Taiwanese students handpicked by their schools and their government to participate in the Family Table — Happy Home, World Alliance program (HHWA). The Sunday service full of passionate fire and no brimstone was the first stop of a week-long stay in Georgina; the first official stop, that is, since the Taiwanese delegation made a pit stop and first-ever visit to Tim Hortons before its much anticipated arrival in Pefferlaw Sunday. “How Canadian is that?” beamed Cedardale pastor Grant Verdoold, who has been flying high to be a part of an international effort supporting family values ever since a 15-hour direct flight to Taiwan Aug. 1. Verdoold and his wife, Karen, met with President Tsai Ing-Wen, government officials and students across the small island nation of 23.51 million in their role as Canadian chairs for the HHWA’s resource and strategy executive committee. Formed in 2001, the HHWA promotes educational initiatives, cross-cultural exchanges and international partnerships to strengthen and encourage happy marriages and families. Taiwan families are in crisis, program general secretary Brandon Chang said, pointing to the fact his country has the highest divorce rate in Asia and third largest in the world; second highest percentage of women in the world that never marry; 63 per cent of fathers who say they sacrifice family life for work; and one of the lowest birth rates, coupled with 500,000 abortions annually. The goal, therefore, of the non-profit charitable organization is a global family educating students through TABLE, which stands for Talk for togetherness; Accept for affirmation; Build for blessing; Listen for love; and Enjoy for example. Family-friendly legislation, social service projects addressing poverty, annual events at orphanages and hospitals, symposiums and encouraging families to eat together and keep Sundays special for family time are just some examples of how the HHWA promotes strengthening family values. The Verdoolds are hosting the entire delegation at their Catering Road home for the week, kicked off by a trip to Niagara Falls Monday. A meet and greet barbecue at the Verdoold house Friday and an evening church service in Pefferlaw Sunday are also planned. “It’s just unbelievable, and wonderful and a sheer delight to be a part of this,” Verdoold said, beaming with the same stirring, joyful, passionate call to “arise and shine” in his sermon , which was received by a resounding and collective “amen”.